Our cancellation and refund policies and how-to for activities, courses, events, and lodge reservations. How to cancel from an activity or a course depends on whether the activity is open for registration and whether a fee is charged. Visit the My Activities and My Courses & Programs section of your My Profile page. Click on the title of the activity or course to get to its detail view. Please note that Global Adventures, Youth Programs, and several Climbing Programs have specific unique cancellation policies outlined below. All course and activity fees incur a cancellation processing fee. This fee is $10 for course and activity fees that are $50 and greater and $5 for fees under $50. Depending on when you cancel, you may or may not receive a refund. Cancellations that occur after registration has closed may only receive a partial refund or none at all if we are unable to fill the slot. Refunds, after registration has closed, are up to the leader's discretion. If there is a fee for the activity and the activity is still open for registration, click on the "Edit or Cancel" button in the "Registration" portlet. You will receive a refund of the fee you paid minus the administrative cancellation fee (This fee is $10 for course and activity fees that are $50 and greater and $5 for fees under $50). In some cases an additional cancellation fee may apply; if so, it will be listed in the Leader's Notes section of the activity's details. If there is a fee for the activity and registration is closed, contact the leader to cancel. Click on the leader's name in the "Roster" tab. Leaders review refund requests on a case-by-case basis and will determine the amount (if any) of the refund. If your status for the course is Cancellation Pending then we have been notified of your refund request. If registration for the activity is still open and there is no fee for the activity, click on the "Edit or Cancel" button in the "Registration" portlet. If the activity registration is closed and there is no fee for the activity, contact the leader to cancel. Click on the leader's name in the "Roster" tab or "Contacts" portlet at the lower right of the page. If the activity is a Global Adventure, please visit the "Leader's Notes" section of each Global Adventure for its cancellation and refund policy. 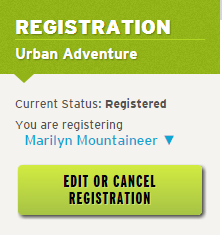 Global Adventures for which you are registered are in the My Activities section of your My Profile page. If no cancellation information is listed for a particular trip please contact the leader. Click on the leader's name in the "Roster" tab "Contacts" portlet at the lower right of the Global Adventure page. Note that Global Adventures incur a $100 cancellation fee. Transfer policy: Campers can transfer from one session to another without penalty (except a $10 administration fee) until 2 weeks before the session they are transferring out of. Transfers within 2 weeks of the registered session will be considered a cancellation. Ability to transfer is contingent upon available space in the session the camper wishes to transfer to. Cancellation policy: Campers canceling until April 15 will receive a full refund minus a $10 administrative fee. Campers canceling between April 16 and June 1 will be subject to a $100 cancellation fee. Campers canceling between June 1 and two weeks before the registered session will receive a 50% refund. Campers canceling within two weeks of the registered session will not receive a refund. This policy also applies to camp transportation services. Participants in Mountaineers Adventure Club pay monthly dues. Cancellation out of MAC must be received in writing by the 25th of the month in order to avoid being charged the following month. Written cancellations must either be in hard copy form with both the parent and youth signature OR via email with both the parent and youth cc'd on the email. Participants who cancel will be eligible to rejoin during the September or January open enrollment period. The fee for the 2017 Intense Basic Alpine Climbing Course, June 17-25 is $1350 for members, with a $200 cancellation fee. If you cancel prior to May 31, you will get a refund minus a $200 cancellation fee. After May 31, If it is necessary to drop out for whatever reason before the first class session starts June 17, $500 will be returned and the remainder, $650 will be credited toward the price of the Seattle regular or Intense Basic Alpine Climbing Course in the future. If a participant drops out for any reason after the course starts on June 17, 2017, they will be granted 2nd-year status and can finish the regular or intense version of the Basic Alpine Climbing Course within the next 2 years at no additional cost. The Mountaineers reserves the right to refuse or cancel a membership in The Mountaineers at any time and for any reason. If The Mountaineers refuses a new or renewing membership, members will be issued a refund for the remaining portion of their membership at the time of termination. Membership cancellation requests received within 90 days of joining may be eligible to receive a full refund less a $10 cancellation fee. Cancellations requests received after 90-days will not be eligible for a refund. Cancellations will be accepted via phone, fax, or email, and must be received by the stated cancellation deadline. All refund requests must be made by the primary membership contact or credit card holder. Refunds will be credited back to the original credit card used for payment. The above policies apply to all The Mountaineers memberships unless otherwise noted in membership materials. Please read all individual materials thoroughly for specific policies. There are no refunds on tickets purchased for Mountaineers public events. In extenuating circumstances please contact our interim facilities manager Bill Ashby. You will receive a full refund if you cancel your stay by noon on the Thursday before your weekend stay. To cancel a lodge stay visit the "My Lodge Stays" page of your profile page. Choose the lodge stay you wish to cancel by clicking on its title and then click the cancel button for each person you wish to cancel. This policy applies to typical weekend stays which generally include Friday night, Saturday night and occasionally Sunday nights for holiday weekends. If your stay is mid-week or not a typical weekend, you must cancel by reservation closing date and time to receive a full refund. Visit the lodge stay page to find this information. If you're not satisfied with your purchase, you may return it for a refund. We will issue a refund to your original form of payment for items returned within 14 days. All returned items must be in their original condition. Your packing slip is not a prepaid mailing label. Customers must pay for return shipping. Electronic books are non-refundable, if you are having compatibility issues please contact customerservice@mountaineersbooks.org. Book and merchandise purchases made at the Seattle Program Center Bookstore are returnable within 30 days of purchase for an exchange or full refund if in new condition. All sales are final on permits, "seconds" book titles, clearance items, and maps.